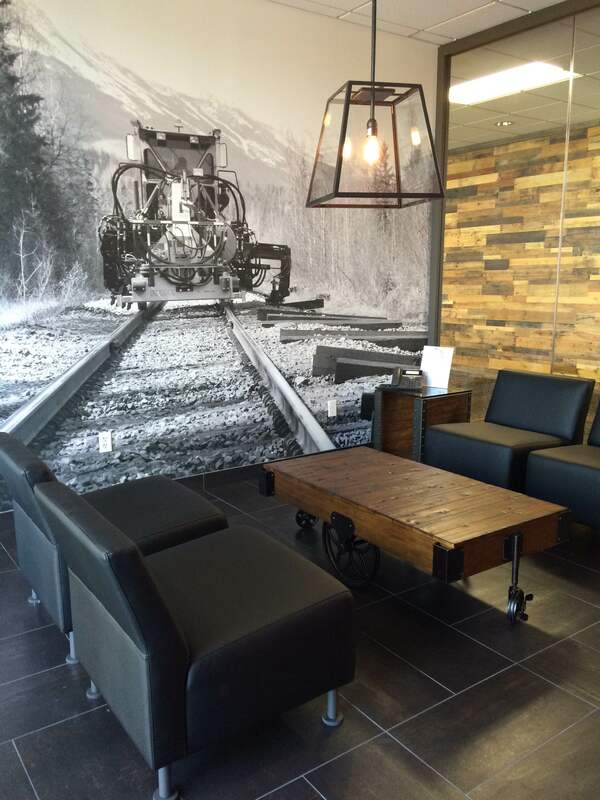 This lobby wall mural is a great example of the kind of thing we can do. Talk about setting the mood in a room! It’s for a company that makes railroad equipment, and it’s a picture of one of their machines. No mistaking what they are all about while you are waiting in this lobby! They actually did four walls in the corporate offices, with Mary Walgren doing the design. We printed on suede wallpaper. I love this photo because it shows how good design brings the colors together in harmony. Nice space! This entry was posted in custom wall murals and tagged corporate design, corporate wallpaper, lobby murals, lobby wallpaper. Bookmark the permalink.